Beewolves are solitary wasps that typically prey on bees. The females dig tunnels and then drag their bee prey into the tunnels, where they lay their eggs on the bee. That way, when the larvae hatch, they have a ready source of food. 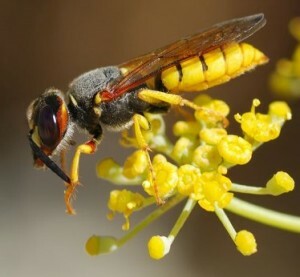 There are several species of beewolves, but one in particular, Philanthus triangulum, loves to prey on honeybees, which makes it a pest for beekeepers. Scientists from both the Max Planck Institute for Chemical Ecology and the University of Regensburg studied the reproductive process of this species, and they found an amazing thing: the female uses a cocktail of antibiotics to protect her young.1 Where does the female get those antibiotics? From bacteria that she cultures in her antennae! The bacteria are from the genus Streptomyces, and they produce a mixture of nine different antibiotics. Each one is only moderately effective as an antibiotic, but when all of them exist together, they provide powerful protection against pathogenic bacteria and fungi that live in the soil in which the beewolves dig their tunnels. Not only does the female beewolf culture these bacteria in her antennae, she actually paints them on the walls and ceilings of the tunnels in which she lays her eggs. That way, the larvae hatch with an “antibiotic shield” around them. The protection doesn’t stop there, however. The larvae take up some of these bacteria, and they then transfer them to their cocoons so that they are also protected during metamorphosis! The design we see in nature is truly astounding, and it is clear evidence for the fact that the world and everything it has been made by an incredible DESIGNER.